This service automatically, starts immediately after ordering. 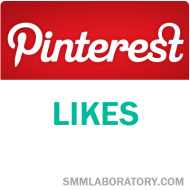 The more Pinterest likes a pin receives, the greater the visibility of the pin. Therefore, whatever product or business you are promoting is subject to receiving a wider audience, increasing the chances of you reaching your goal. The wider the audience, the more attention your product attracts and appealing to one or more demographics becomes more and more likely.